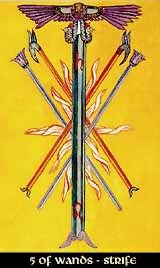 Like all Fives, the Five of Wands stands for Geburah - motion and changing and the powers of destruction - and 5 is the number that breaks the stability and structure of the Four. Fire isn't meant for settling and resting, and the flames burn high to break out of their own realm of the Four. This means revolutionary movements and aggressive renewals, and sometimes this isn't the most pleasant way to go. Especially not when we felt good and comfortable in the secure structure of the Four. In the shadowy aspect, the violent disruption of the struggling flames can mean that we're just agressive and restless, making trouble for no better reason than being bored.